Hyundai Motor celebrated its presence at the Auto Shanghai 2015 (2015 Shanghai International Automobile Industry Exhibition) with 24 models, including the All-New Tucson Concept, specially adapted for the Chinese market, which made its first appearance in China. <Technology for a Better Tomorrow> being Hyundai Motor’s theme for the auto show, Hyundai unfolded its present and future in a space of 2,921㎡. Hyundai Motor’s commercial vehicle joint venture, Sichuan Hyundai Motor Company, had a stand of its own in Pavilion 3. 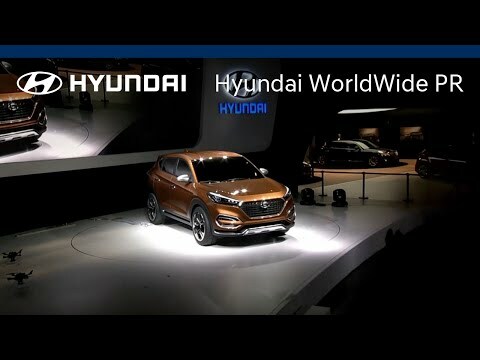 5 Hyundai commercial models including County with a renewed headlamp and radiator grille design, boasting improved riding comfort, was showcased in the hall. Based on the All-New Tucson world premiere in Geneva Motor Show 2015, the All-New Tucson Concept model, exclusively adapted for China with its Gold-citrus color exterior, made its debut in China. The All-New Tucson Concept shows a more enhanced boldness on its exterior with a futuristic headlamp and rear lamp, fog lamp garnish, side mirror and rear diffusor finished with aluminum as well as a newly added side chrome molding. The All-New Tucson is waiting for its actual launch later this year in China. The i20 Rally Car racing at WRC (World Rally Championship) was exhibited! Visitors were also able to experience a virtual race of WRC competitions through a 4D machine. The eco cars, Hyundai’s vision for a better future. Sonata plug-in hybrid and ix35 Fuel Cell was exhibited, along with a virtual model for a fuel-cell driven society. The most advanced IT technology! The Blue Link Zone included diverse interactive displays including the 3rd generation Blue Link kiosk.